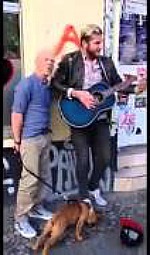 JIMMY SOMERVILLE SURPRISES A STREET MUSICIAN! This just has to be the best clip of 2013, despite the vertical phone footage! A street musician is performing the Bronski Beat hit Smalltown Boy. Okay, nothing special about that, what's all the fuss about? Then the legendary Scottish frontman, Jimmy Somerville (who just happens to be walking his dog in Berlin) surprises him by joining in singing along with him, and his legendary falsetto sounds better than ever! There aren't many clips on the web that are entirely genuine these days, but this is definitely a perfectly-captured, joyous moment with a perfect ending; "is it you?" asks the German musician? "It's me, it's me!" proclaims Jimmy. Wonderful! Here is an interesting cover of Smalltown Boy by LittleBoots which I discovered on Soundcloud.